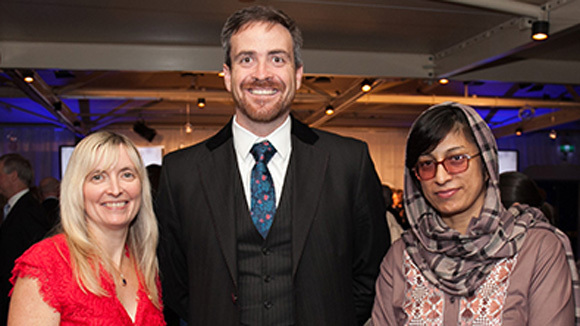 Two inspiring UTS alumnae have been honoured this week at the Advance Global Australian Awards for their exceptional impact on the world around them: health informatics researcher, Professor Carolyn McGregor AM (BAppSc Computing Science 1991; PhD 2003); and Afghan human rights champion, Nasima Rahmani (LLM 2007). Professor McGregor, who holds the Canada Research Chair in Health Informatics at the University of Ontario Institute of Technology, received the 2015 Advance Global Australian Award for Technology Innovation for her frontier research with great human impact. Initially applied in the neonatal intensive care environment, McGregor’s breakthrough work with big data is now being applied to monitoring astronaut health for NASA’s planned Mission to Mars in 2030, and to revolutionising the mental health landscape for conditions like Post Traumatic Stress Disorder. UTS Luminary Nasima Rahmani, Director of the Women’s Empowerment Centre at the Gawharshad Institute of Higher Education in Afghanistan, was honoured as recipient of the 2015 Advance Global Alumni Award. Rahmani has selflessly devoted her life to ensuring the human rights of women in Afghanistan, and empowering them by widening access to lifelong education. © Copyright UTS - CRICOS Provider No: 00099F - 04 September 2017 12:51 PM. The page is authorised by Deputy Vice-Chancellor and Vice-President (Corporate Services).